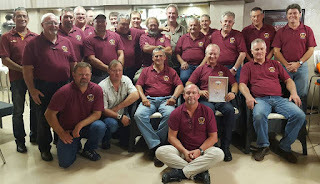 Conceived by Nico Beneke and ably assisted by Johan Landman - the Chairman and Vice Chairman respectively - Rooiplaas hosts several get-togethers throughout the year with the aim of bringing together ex-SADF airborne soldiers to socialize, make new friends, and reacquaint themselves with old friends. It has, since its inception, become a home for many men who served in the SADF’s airborne units and it is growing from strength to strength. What appealed to me is that this organisation is devoid of the politics and petty personal grievances some of the other veterans’ organisations are tainted with. Chappies van Zyl, one of my ex-airborne sappers from days long past, eventually gave me no choice but to join the Rooiplaas community and Nico and Johan were very gracious to accept me into their ranks. And so it was that I was invited to attend their get-together in Bloemfontein on 23 February 2017. On arrival, I was given a Rooiplaas T-shirt and cap just to make sure I was able to blend-in and not stand out like a sore thumb. I was both honoured and privileged to give a brief discussion to the men (and their wives) on Executive Outcomes and STTEP, their founding, deployments, operations and so forth. Some of the talk was also centred on the disinformation and myths regarding both EO and STTEP. After my talk, I was awarded my Rooiplaas Certificate of Membership (#0245) that will take pride of place in my study. However, the success of any such event depends on numerous players who are not always visible but whose contributions make such an occasion a great success. 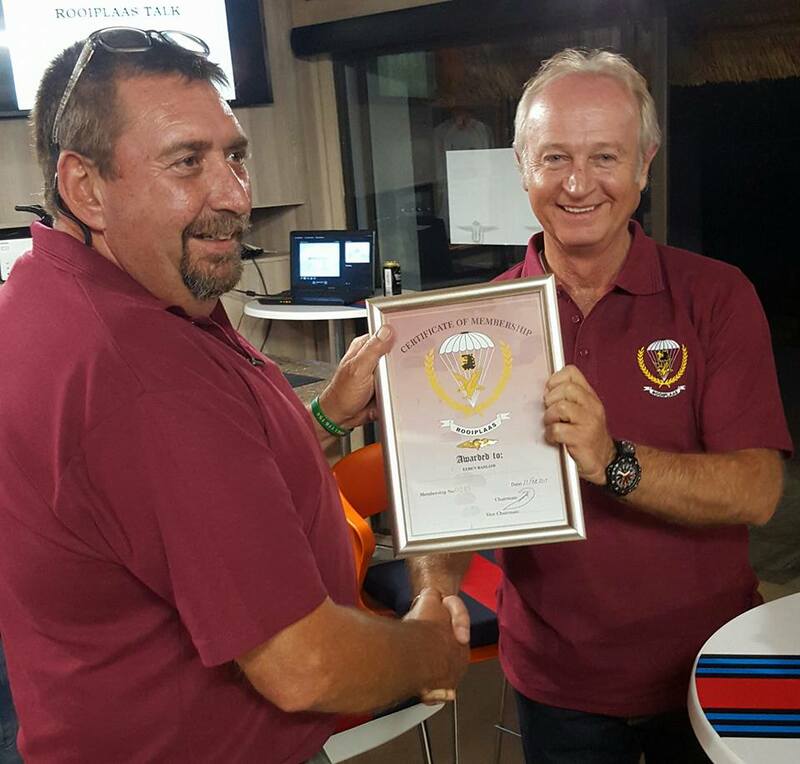 Thank you to Chute Systems who were kind enough to allow Rooiplaas to use their magnificent Bloemfontein facility. One of the owners, Waldo Krähenbühl, was on hand at all times to give his support and assistance wherever he could. Sadly, his colleague and co-owner, Douw Raimondo, was elsewhere and could not attend the evening with us. Andre Botha deserves a special thank you for taking control of the ‘ kitchen’ and preparing a great meal for us. The meal was way better than any of us had ever experienced in our army days. Nico provided the food we all enjoyed. To the members of Rooiplaas and their wives, thank you for accepting me into your ranks and for not falling asleep during my talk. To Nico and Johan a special word of thanks for organizing the get-together and for being such great hosts. A great thank you also to Nico Beneke for accommodating me at his wonderful guesthouse and for getting up early to make me coffee and see me on my way. 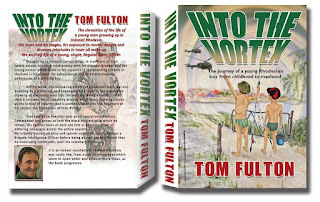 I count myself fortunate that I was able to lay my hands on a copy of Tom Fulton’s book ‘Into the Vortex’. Despite the many books written about the wars and conflicts in Southern Africa, this book is worthy to stand on its own. Perhaps it was inquisitiveness or perhaps I was trying to relive the days of growing up in a slow-boiling Africa through Tom’s eyes, or perhaps both. Regardless, Tom’s book did not disappoint me. The book is a vivid and exciting glimpse into days long gone—days when boys were boys and were forced through circumstance, challenges and conflicting politics to grow up and stand tall as both men and soldiers called on to fight a dirty war. Tom takes the reader into his home as a young boy growing up in a sometimes difficult environment, but there is no pity as that was how it was—instead he uses his humour to lighten the situations he and his brother frequently found themselves in. His entry into the Rhodesian Army and the subsequent humour and oftentimes sorrow that followed is well written and intense. Commissioned as an officer in the Rhodesian African Rifles (RAR), he goes on to discuss the bonds made and shared as only men under fire can do. Readers who are unfamiliar with Africa and the closeness and comradeship of black and white men at war will do well to take note of the respect they had for one another. The scenes of combat are well and intensely described along with the tension before triggers are pulled and the exhilaration of success and survival when the guns fell silent. At times, the fast pace of combat is softened with humour and the aftermath of a deployment where young men go about their social lives—social lives that were lived and enjoyed to the maximum. Tom’s easy style of writing brings to life many sad and traumatic events, yet there is no trace of victimhood—the mark of a man and a soldier with character. 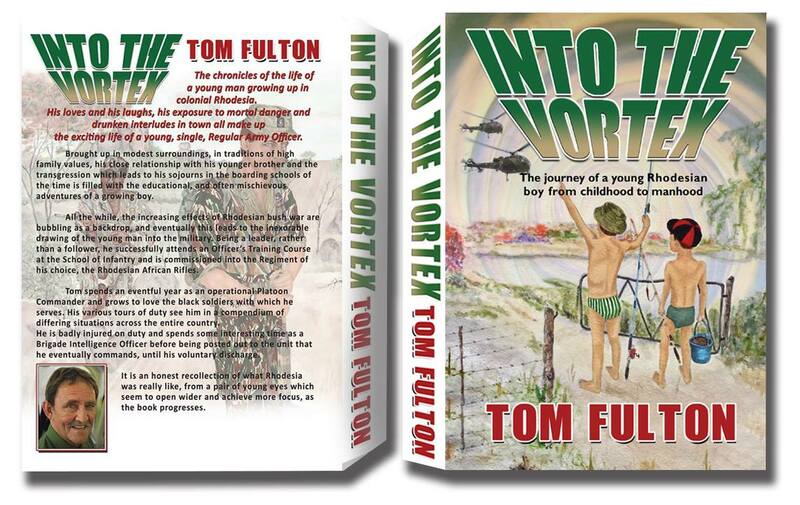 As clichéd as it might be, ‘Into the Vortex’ will stand on its own as a Rhodesian classic. Note: This is not a verbal attack on the KDF and I will not entertain comments in that vein. The very tragic events at El Adde (Somalia) surrounding the recent fall of the Kenyan Defence Force (KDF) base to Al Shabaab’s ‘Saleh al Nabhan Battalion’—al Qaeda’s East African affiliate—is a good example of how many things that are wrong with African armies came together in a perfect storm. The video produced by the enemy is equally disturbing as it illustrates the unpreparedness of the KDF. Regretfully, African governments and their armies continue to ignore the warning signs that result in an inability to prepare and defend against the coming storm…it is not a matter of ‘if’ but of ‘when’ the storm will make landfall and increase the damage to their countries and their credibility. 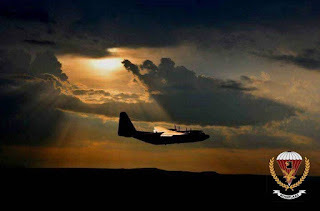 Africa is both today and tomorrow’s battlefield and it is being shaped today through a series of secret or shadow wars, proxy forces, covert actions, diplomatic and economic pressures, and domestic and regional terrorism. Added to this is a failure of governance that many African states exhibit and that has given rise to populism—a movement that is increasingly turning to violence and armed actions. More worrying though, our armed forces are failing to keep pace with the ever-increasing speed of conflict and war. The pace at which technology has enabled information, intelligence, instructions, and disinformation to be transmitted via cell phones, social media and radio messages, has dramatically increased the pace and tempo of operations. It has also increased and underlined the requirement for in-depth intelligence operations to distinguish between fact, fiction and deception. Filming these attacks, and highlighting many KDF failures, merely adds to the enemy’s propaganda efforts, and motivates and inspires potential recruits, when indeed, it ought to be the other way around. Armies need to realise that we need to think quick, act and react with agility and speed—or die. If quick thinking and agility is discarded, our armies may as well call it a day. Instead, we try to stick to what we think we know—ill-equipped, unbalanced World War 2 organisations totally unsuited to cope with the demands and fluid actions on the modern African battlefield. This has resulted in poorly planned and uncoordinated operations, a lack of balanced forces, a lack of operational sustainability, a lack of momentum and great sluggishness when tasked to move rapidly—to name but a few. These outdated approaches are then taught to African armies by trainers that have no or very little experience of the continent and indeed, seldom if ever, understand the enemy. Oftentimes, a different agenda is at play and the conflict is encouraged to continue as long as possible. All too often, people want to point fingers at how bad their armies are, and the politicians are quick to blame them for a lack of battlefield success. But, the reality is that soldiers can only do what they are trained and equipped to do—and if they have the leadership they require supported with political and military will. To fulfil their missions, African armies need to do a very serious doctrinal rethink, reorganize themselves to be agile, have mobility and firepower, ensure they have clear and unambiguous missions and mandates, and ensure the leadership group know how to lead—from the front. The attack on El Adde ought to serve as a dire warning of what can happen to any armed force if we do not get our act together, sooner rather than later. Our armies need to be correctly trained, equipped, and postured, and not taught rubbish that is irrelevant. We need to start thinking very seriously before it is too late.